In fact, for all the posturing on the subject by the Obama administration, by the EU and European states, by the UN, and by other nations and international bodies, there is no such thing as “Palestinian land” in international law, or at least there was not before the Oslo process, formally initiated in 1993. To the contrary, international law supports Jewish claims to the so-called occupied territories. The League of Nations, in creating successor entities to portions of what was formally the Ottoman Empire, established the “Palestine Mandate” for the lands between the Jordan and the Mediterranean and the right of Jews to claim and settle in those lands. Indeed, it called for “close settlement by Jews on the land, including state lands.” Article 80 of the United Nations charter subsequently preserved the application of the League of Nations Mandate’s stipulations. One could argue that the Jews’ governmental body, by accepting the 1947 partition plan for Mandate Palestine, essentially gave up any claim to, including the right of settlement in, areas not allotted to it. However, the Palestinian side rejected the plan and failed to establish a successor government in the areas that were to fall under its control. Subsequently, Judea and Samaria were occupied (with the killing or expulsion of all their Jewish residents) and annexed by Transjordan, which then renamed itself Jordan. But only two nations, Britain and Pakistan, recognized Jordanian sovereignty in the territories. In 1967, Jordan – as King Hussein himself acknowledged – launched hostilities against Israel, and Israel, in its response, gained control of Judea and Samaria. In effect, whatever claims and rights Israel was prepared to give up in 1947 became irrelevant when no legitimate alternative government of Judea and Samaria emerged, and so the rights enshrined in the Mandate and in Article 80 of the UN charter remain in force. Also relevant is UN Security Council Resolution 242, adopted unanimously in the wake of the 1967 war. It calls for peace talks between Israel and its neighbors and, rather than Israel’s return to the prewar armistice lines, for the negotiation of new “secure and recognized” boundaries. Further, the authors of Resolution 242 explicitly stated that the prewar armistice lines made no sense as permanent borders, invited further aggression against Israel, were untenable, and ought to be replaced. Resolution 242 does not in itself strengthen the already strong legitimacy in international law for Israel’s claim to the territories. But it is relevant in several respects. First, Resolution 242 underscores the status of Judea and Samaria as disputed territory whose ultimate disposition is to be decided by negotiations between Israel and its neighbors. In addition, with regard to settlements, most have been established with a view toward reinforcing Israeli claims to key strategic areas in Judea and Samaria – those most germane to providing Israel with defensible borders as envisioned in 242. In fact, not all of Judea and Samaria are currently disputed territories, as Israel ceded parts of these areas to the Palestinians in the context of the Oslo process. The Oslo accords entailed a division of these territories into Areas A, B, and C. Area A was placed under full Palestinian Authority control; in Area B the Palestinians assumed full civil authority while Israel retained responsibility for security; and Area C remained under Israeli control. Areas A and B comprise about 40 percent of Judea and Samaria and are home to well over 90 percent of the Palestinian population of the territories. Some have argued that Israel is not obliged to maintain its relinquishment of these areas as the Palestinian Authority has never fulfilled its obligations under the relevant Oslo accords. In particular, it has never recognized Israel’s right to exist, has never ended incitement promoting the murder of Israelis and delegitimization and destruction of the state, and has never abandoned terror to advance its anti-Israel agenda. But no Israeli government has sought to reverse the ceding of Areas A and B.
Israel, of course, also unilaterally ceded all of Gaza to the Palestinians in 2005. Since then, particularly since Hamas seized control of Gaza in 2007, Israel has been subjected to recurrent, often incessant rocket bombardment and other assaults from the territory, as well as three wars initiated by Palestinian aggression. Yet Israel has never sought to reverse its ceding of Gaza. But Obama’s doing so is part of a broader agenda. Throughout his presidency, he and others in his administration have put the onus on Israel for breakdowns in negotiations and for the absence of any progress toward a resolution of the conflict, when it is patently obvious to any honest observer that it has been Abbas and the Palestinian Authority that have consistently scuttled talks. Netanyahu has repeatedly offered to resume talks without preconditions; Abbas has invariably insisted on preconditions Israel must fulfill before he will agree to meet. Obama, though, has ignored Abbas’s intransigence throughout his time in office. Obama and those around him have, more specifically, spoken most about Israel’s expanding settlements and establishing new settlements as the obstacle to progress and as potentially rendering an agreement impossible. But Israel has established no new settlements for decades, and construction in existing settlements has taken place on a far smaller scale under Netanyahu than under his predecessors, including Rabin during the Oslo years. In the course of Obama’s presidency, Netanyahu agreed to a ten-month settlement freeze to help jump-start talks; no predecessor had ever imposed such a freeze. Abbas waited until a month before its expiration before engaging in a meeting, then insisted on extension of the freeze as a condition for continuing to meet. Yet Obama persisted in primarily blaming Israel for the lack of progress. Another element in all this has been the administration’s ignoring or downplaying Abbas’s declarations that he will never recognize the legitimacy of a Jewish state within any borders; his insistence that the Jews have no historic roots in the land and are merely alien usurpers whose state must be extirpated; his incitement of his people to violence and murder; his praise of terrorists and financing of them; and his enlisting the schools, mosques, and media under his control to propagate the same history-distorting, defamatory, murderous messages. Occasionally, when Abbas’s incitement would reach a particularly high pitch and unleash an increase in deadly attacks on Israelis, Obama would offer some low-key, anodyne criticism, most often without naming Abbas. Obama’s broader agenda has entailed his seeking to establish Israel’s withdrawal essentially to the pre-1967 armistice lines as the centerpiece of any future accord. Indeed, the ultimate intent of his characterization of all territory beyond the pre-1967 lines as “Palestinian land” is to promote such a withdrawal as just and inevitable. Yet another falsehood employed by the administration in advancing this formulation has been attempts to characterize Israeli resistance to such a withdrawal as essentially a stance of parties of the Israeli right. In fact, a wide array of Israelis agree with the authors of UN Security Council resolution 242 that the pre-1967 lines were ultimately indefensible, invited aggression against Israel, and should be replaced by new, “secure and recognized,” boundaries. Among the changes he envisioned and enumerated – while making clear that these are “the main changes, not all of them” – were “First and foremost, united Jerusalem, which will include both Ma’ale Adumim and Givat Ze’ev – as the capital of Israel, under Israeli sovereignty.” Also, “The security border of the state of Israel will be located in the Jordan Valley, in the broadest meaning of that term,” by which he meant Israeli control of the heights overlooking and dominating the valley in addition to the valley itself. Rabin also listed “Gush Etzion, Efrat, and Beitar,” and he referred to “other communities” as well and “the establishment of blocs of settlements in Judea and Samaria...” No, Israel’s need for defensible borders that entail retaining some lands beyond the pre-1967 lines is not simply a formulation of the Israeli right. Abbas and those around him in the Palestinian leadership see pushing Israel back to the pre-1967 lines not as part of a resolution of the conflict but as just a stepping-stone to Israel’s destruction. This is consistent with Yasir Arafat’s agenda, as reflected in his moves in 2000. At Camp David in the summer of that year, Arafat not only rejected Ehud Barak’s territorial offers and President Clinton’s proposals; he refused to offer any counter-proposals. He did so because any accord would have required his signing an end-of-conflict agreement, something he was not prepared to do. He envisioned future claims against Israel, leading to its demise, and was not prepared to forgo such claims. Instead, Arafat left Camp David and launched his terror war against Israel. His preferred scenario after Camp David was to get the international community to force an Israeli withdrawal without extracting any obligatory concessions from the Palestinians, and this is Abbas’s preferred scenario as well. Consistent with this, Abbas goes to the United Nations seeking recognition of “Palestine,” condemnation of the “occupation,” condemnation of settlements, and pressure on Israel to withdraw to the pre-1967 lines, while giving nothing in return, avoiding any direct accord with Israel and, in particular, reserving the right to future claims against the Jewish state. And Obama has given Abbas leeway to play this scam. At times he has insisted on direct negotiations between Israel and the Palestinians as the only way forward and declared this to be American policy. But he and his administration have at other times not aggressively countered Palestinian efforts to win official recognition and concessions from the UN and its constituent bodies, to promote pressure on Israel from the UN and other international organizations, and to try to force Israeli concessions without direct negotiations and without Palestinian recognition of Israel. There has been much speculation in the media and elsewhere of what further steps Obama might take now, in the wake of the presidential election, when he is no longer inhibited by electoral politics. Some have suggested that he might refuse to exercise the usual American veto of anti-Israel resolutions in the Security Council and instead abstain on a resolution condemning settlements or declaring them illegal or a resolution setting out the parameters of a territorial settlement, including Israeli withdrawal to the pre-1967 lines. Others suggest he might issue a statement of his own containing his vision of the parameters of an agreement and likewise including Israel’s retreat essentially to the pre-1967 armistice lines. Whatever Obama does, what will be the sequel once Donald Trump is in office? The new administration should reaffirm that it will not be bound by any UN action that entails abandonment of Security Council Resolution 242 as the basis for negotiations and settlement of the conflict and that it will only support direct negotiations between the parties as the path to a settlement. Whatever happens between now and Trump’s inauguration, the essentials of the Arab-Israeli conflict will remain unchanged. The conundrum of finding a means for Palestinians to pursue a more thoroughly separated political course while leaving Israel with defensible borders uncompromised by the Palestinian presence will still be unresolved. And there is little basis for hope that the Palestinians will at any time in the foreseeable future give up their rejectionism, their refusal to recognize Israel’s legitimacy within any borders, and their determination to go on pursuing Israel’s annihilation. But at least there is the possibility of a new administration that will not encourage the Palestinians by parroting many of their anti-Israel indictments and casting Israel as the party most responsible for the absence of peace. There is likewise the possibility of an administration that will not indulge the Palestinians by financing them despite their rejectionism but might rather make clear to them that there will be a price to pay for hewing to their hate-filled, essentially genocidal course. As another academic year begins at American colleges and universities, one can expect to see a continuation of the pattern in recent years in which many Jewish students either take a neutral stance in the face of the currently rampant campus assault on Israel or actually join in the assault. Among the latter, some embrace the self-described “pro-Israel” but, in fact, Israel-bashing campus incarnation of J-Street, while others go further and enlist in the ranks of groups less coy than J Street, groups that, for example, more unambiguously promote the boycott, divestment and sanction (BDS) agenda against Israel. These include the explicitly anti-Israel Jewish Voice for Peace (JVP). A number of Jewish students even join the cadres of the often openly anti-Semitic Students for Justice in Palestine (SJP), founded as an offshoot of the General Union of Palestinian Students and now the premiere BDS-cheerleading, Israel-demonizing organization on American campuses. Significant voices in the Jewish community, looking at this phenomenon, and perceiving as well in some quarters beyond the universities a decrease in American Jewish identification with Israel, correlate these developments with supposed Israeli government failure to take steps towards advancing peace. This argument has been made by, among others, Gary Rosenblatt, editor and publisher of The Jewish Week, a newspaper produced with the support of the UJA-Federation of New York. The obvious implication is that the author does not see the prime minister as having been acting in Israel’s national interest, and that - reflecting the thrust of the article - Rosenblatt is referring specifically to the prime minister’s not being forthcoming enough in the quest for peace. But can the falling away from Israel observed among many Jewish students on American campuses and among others in the American Jewish community genuinely be correlated with Israel’s not doing enough to advance peace? First, is it true that Israel is responsible for the impasse vis-a-vis peace? Any objective look at the history of efforts to achieve peace and at the reality on the ground today can only conclude that the claim of Israeli culpability is not credible. Palestinian leadership is currently divided between Hamas, which rules Gaza, and the Palestinian Authority under Mahmoud Abbas, which governs in Palestinian-controlled areas of the West Bank. Hamas is openly dedicated not only to the killing of all Jews in Israel but all Jews worldwide. With Israel’s total withdrawal from Gaza in 2005, the Palestinians living there were free to turn the territory into another Singapore or Hong Kong and would have had wide Arab world and other support for doing so. That their leaders have chosen instead to eschew pursuing the building of a prosperous state for the sake of hewing to their genocidal priorities can hardly be blamed on Israel and cannot be remedied by any Israeli concessions. The agenda of the Palestinian Authority differs little from that of Hamas. Abbas and his PA and Fatah associates insist on Israel’s illegitimacy and assert constantly that Jews have no historical, authentic connection to the land and are merely colonialist usurpers whose presence must be extirpated. The message hammered in their media, preached in their mosques, and taught in their schools is lurid defamation of Jews and the promotion of dedication to Jew-killing and to Israel’s destruction as the obligation of every Palestinian. Abbas himself has repeatedly insisted that he will never recognize the legitimacy of a Jewish state within any borders. He has rejected every offer of territorial compromise because proposals of a settlement have been conditioned on such Palestinian recognition of Israel and explicit acceptance of an agreement as a final status document. He and those around him refuse to forego future additional claims against Israel with the ultimate objective of the Jewish state’s dissolution. This was the same reason why Arafat in 2000 rejected Ehud Barak and President Clinton’s offers of a settlement and instead launched his terror war against Israel. When Netanyahu imposed a ten-month moratorium on all construction within settlements, something no other prime minister had ever done, Abbas waited almost until the expiration of the moratorium to agree to a meeting and then predicated further meetings on an extension of the moratorium. Netanyahu has since been offering resuming bilateral negotiations without preconditions; Abbas refuses. Abbas’s preferred scenario, like Arafat’s before him - the scenario Abbas is currently promoting at the UN and in Europe - is imposition of a territorial agreement on Israel backed up by international sanctions, an agreement that will entail no direct obligations on the PA but rather grant it a state without obliging it to forego further claims against Israel. It is the strategy enshrined in the Palestine Liberation Organization’s 1974 “plan of phases,” in which the PLO proposed to take whatever land it could gain by diplomacy and use that land as a base for pursuing Israel’s annihilation. All of this is well known to anyone who cares to know. To correlate the falling away of support for Israel among some Jews, including some who have embraced stridently anti-Israel positions, with supposed Israeli intransigence vis-a-vis the quest for peace is disingenuous at best. But there is a correlation to be made. Whatever weakening there is of Jewish support for Israel, on American campuses or elsewhere, can be correlated with the intensity of the local assault on Israel. Where the assault is most intense, so too is the falling away. It has always been thus when Jews have been under siege, whether the target has been Diaspora Jewish communities or the Jewish state. Invariably some Jews have sought a solution to the painful onslaught by embracing the arguments of the attackers - however bigoted or absurd. They would either promote communal self-reform to, they imagine, placate the attackers; or detach themselves from the community to escape the assault; or even join the attackers to more dramatically disassociate themselves from the targeted Jews. Israel’s experience of chronic besiegement has led to such reactions even within the country. Such predilections lay behind the Oslo process. Arafat had never hidden his determination to pursue Israel’s destruction. 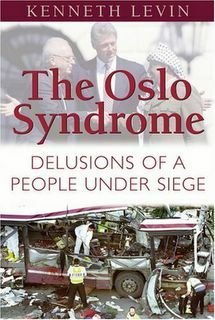 Indeed, on the very night of the famous handshake on the White House lawn in September 1993, and the signing of the initial Oslo accords, Arafat was on Jordanian television from Washington explaining to his constituency and to the wider Arab world that they should understand Oslo as the first phase of the aforementioned “plan of phases” for Israel’s annihilation. He and his associates repeated this and similar declarations of their ultimate objective, as well as engaged in other forms of anti-Israel incitement, throughout the weeks and months that followed. In addition, in the wake of Arafat’s arrival in the territories, terrorism reached levels of intensity never before seen in Israel. Yet virtually half the population of Israel, and a much higher percentage of its elites, insisted on deluding themselves into believing that Israeli concessions via the Oslo process would placate the nation’s enemies and lead to peace. Only after Arafat turned down all the concessions made by Ehud Barak at Camp David in the summer of 2000, likewise rejected President Clinton’s proposals, offered no counter-proposals, and instead launched his terror war, which over the ensuing few years killed more than a thousand Israelis and left thousands more horribly maimed, did those Israelis enthralled with Oslo begin to wake in large numbers from their delusions. Still more did so in response to Israel’s unilaterally withdrawing from Gaza in 2005 and receiving in return thousands of rockets aimed at its cities and villages and three mini-wars. There remain Israelis who, despite all the intrusions of blood-soaked reality on their wishful reveries, continue to embrace fantasies of Palestinian leaders as peace partners and Israeli concessions as resolving the conflict. But they are far fewer now, as reflected in recent elections and opinion polls. It is significant, however, that greatly overrepresented among them are members of the nation’s elites - cultural, academic, journalistic, and elements of the political elite. Consequently, much of the chatter we hear from Israel, chatter dominated by those elites, entails reprises of Oslo-era delusions and gives a very misleading picture of what most Israelis think now. But the problem is not simply that American Jewish leaders respond to fringe Israeli voices that demonize Israel and do so because such voices, while marginal within Israel, are overrepresented within the Jewish state’s vocal elites. Rather, too many American Jewish leaders are predisposed to embrace the message of those voices, the message that a solution to the conflict could be had if Israel would only will it. And they are predisposed to that message because too many American Jewish leaders are swayed by the indictments of Israel coming from strata of America with which they identify: the Obama administration, major constituencies within the Democrat party, elements of the cultural elite, the liberal churches, the professoriate and its campuses. They are eager to embrace these groups’ indictments as fair and reasonable, even though they are not, and to seek modification of Israeli policies to assuage the indicters, all - as Steinberg suggests - with little consideration of what most Israelis think or of Israel’s actual predicament. Again, this is an old story. Indeed, criticism of Zionist aspirations by some Jewish leaders and elements of the broader Jewish community, criticism in deference to external pressures, long predated the modern Zionist movement. In, for example, German states in central Europe in the late eighteenth and early nineteenth centuries, a major argument invoked against extending civic rights to Jews was that the Jews constituted a separate nation and so were unfit for such rights. A common Jewish response was to disavow any such national self-comprehension; and new, reformist congregations even stripped the liturgy of references to longing for Zion and Jerusalem to emphasize this new self-definition. In addition, as is typical when minorities embrace the indictments of the surrounding majorities and seek to appease them via self-reform, Jews following this course did not acknowledge they were doing so to appease bigoted attackers. Rather, they cast their course as moral and ethical. They argued that while Judaism always had its universal mission, a mission of promoting a more ethical, humane order in the world, Judaism as a light unto the nations, that mission had become Judaism’s exclusive role over the preceding two millennia and any return to national aspirations was an atavistic step to be shunned. The anti-Jewish indictment arguing that Jews did not deserve equal civic rights because they were part of a separate nation, and the accommodating response by major elements of the community, merged with a related indictment and related response. An additional, common anti-Jewish line of attack was that Jews were uniquely disposed to focus only on their own narrow, parochial interests and disregard the plight of those beyond their own community. The response by some Jewish leaders and others within the community was to eschew Jewish communal issues - even as Jews were confronted with particular challenges and particular threats; to ostentatiously demonstrate their devotion to addressing problems other than those of their own community; and to depict the abandonment of the former and devotion to the latter as the moral, ethical course. Essentially the same dynamic can be seen at play today as many Jewish leaders and the communal institutions they head give priority to accommodating those elements of American society critical of Israel, elements which they - in a skewed vision of reality that has its own distinct history - are predisposed to see as representative of the moral, ethical course which is the proper, universal Jewish vocation. They are more prone to giving ground in the face of criticism of Israel by those elements, however unfair and biased the criticism, than in looking closely at the threats Israel faces and its strategic challenges and vulnerabilities and responding forcefully to critics who ignore those realities. It should come as no shock then, given all this, that so many Jewish students go off to college knowing little of those realities. How can it be otherwise when - even looking at students who grow up in households connected to Jewish institutions - what they and their families hear in their temples and read in their Jewish newspapers and imbibe from other community organs is as likely to be indictments of Israeli policy, all too fully internalized by rabbis and editors and organization heads, than any informed, reality-based, clear-sighted, intellectually honest and unapologetic defense of Israel? And what do Jewish students encounter on campus? One reality greeting them will be a well-documented increase in anti-Semitism, including even, in some instances, physical assaults on Jews, much of it incited and perpetrated by the, again, often openly Jew-baiting Students for Justice in Palestine (or, perhaps more properly, Students for Judaeophobia), whose objective is Israel’s annihilation. As noted, they will also encounter some Jews among the mostly Muslim cadres of SJP. Also greeting them on many campuses will be what is, in effect, SJP’s Jewish auxiliary, Jewish Voice for Peace. Like “Students for Justice in Palestine,” “Jewish Voice for Peace” is a propaganda-driven misnomer; the only peace the organization proffers for Israelis is the peace of the dead. A perusal of its website reveals its parroting of virtually every anti-Israel canard promoted by Hamas, the Palestinian Authority and their fellow travelers, and its endorsing of those groups’ goals. For JVP, prior to the League of Nations action mandating creation of a Jewish homeland in “Palestine,” the area was not part of the Ottoman Empire but rather a Palestinian Arab state which the Jews subsequently usurped; and there was no Arab expulsion of close to a million Jews from Arab nations, and no Arab efforts to annihilate the Jews of the Mandate, and Jews have no right to national self-determination, and Palestinian Arabs have the right to pursue Israel’s dissolution. That a small minority of Jewish students take the extreme step of affiliating with JVP or SJP should not be entirely surprising. Motivations no doubt vary from individual to individual. Some, for example, may simply be following a family tradition of bowdlerized, ultimately auto-genocidal, Jewish “morality,” while others may be rebelling against a more conventional familial Jewish connectedness. But the broader reality is that, again, whenever Jews have been under attack there have always been some who seek to escape the assault by joining the attackers. Perhaps this is even more the case in an academic environment, as students are particularly eager to be accepted by their peers and their professors and to deck themselves in the current campus fashion, whether its hue be far-Left red or fascist brown. The strange contemporary alliance between red and brown, far Left “progressivism” and Islamist fascism, seems particularly compelling for some. J Street’s campus operation, which, like the parent organization, characterizes itself as pro-Israel and pro-peace, and which promotes the parent organization’s policies, has drawn a much larger following among Jewish students than JVP or SJP. But its pro-Israel claims run counter to those policies. Israelis of almost all political stripes reject a return to the pre-1967 armistice lines, the so-called Green Line, in any Israeli-Palestinian agreement. The consensus is, as the authors of UN Security Council Resolution 242 (the key UN document relating to the territorial issue) asserted, that those lines left Israel too vulnerable and invited further aggression against the country. Yitzhak Rabin, in his last Knesset speech prior to his assassination, listed West Bank areas - an incomplete list, he indicated - that Israel would need to retain and populate in any final settlement to assure its security and survival. Yet J Street opposes any Israeli presence beyond the Green Line and advocates the United States supporting, via unilateral policy initiatives or a UN Security Council resolution or an initiative in conjunction with other major powers, reversing Resolution 242 and endorsing the Green Line as the basis for defining a future border. J Street also advocates the United States instituting punitive measures against Israel for any activity beyond the Green Line. It also claims that American administrations have consistently viewed settlements beyond the Green Line as “illegal,” when in fact only the Carter Administration labeled them illegal and, as attested to by many experts in the field, there is much in international law that weighs in favor of their legality. Israelis have fought three wars against Hamas in Gaza since Israel’s withdrawal from Gaza in 2005, with each conflict triggered by Hamas attacks, particularly rocket fire, against Israel’s civilian population. Yet J Street has repeatedly drawn a moral equivalence between Israel and its openly genocidal foe, and has often parroted Hamas claims and statistics about the course of the conflicts and the resultant casualties. J Street is consistently silent about the goals of Hamas and of the Palestinian Authority, their mutual rejection of the legitimacy of a Jewish state within any borders in “Palestine,” and the PA’s rejection of all negotiation proposals offered by Israel or by the United States. J Street asserts it opposes the “global BDS movement” that targets all of Israel for boycott, divestment and sanction, but does not oppose BDS efforts targeting the territories beyond the Green Line. It sees such boycotts as consistent with its goal of promoting Israeli withdrawal to the Green Line. But, again, the vast majority of Israelis, along with notable Western military and strategic experts, believe that such a withdrawal would render Israel fatally vulnerable. In addition, the “global BDS movement” also promotes, like J Street, more circumscribed boycotts limited to the territories, as in its partially successful efforts to advance such boycotts in Europe. It does so because it knows that even such limited boycotts, which serve to weaken Israel’s presence in the territories, in advancing the goal of Israeli retreat to the Green Line serves also to undermine Israel’s strategic viability and ultimate survival. J Street has worked with supporters of the Iranian government and strongly backed last year’s agreement with Iran that legitimized that nation’s nuclear program and released to the mullahs over $100 billion in embargoed funds in exchange for limited curtailment of its pursuit of operable nuclear weapons. It did so even as Iran has consistently reasserted its goal of annihilating Israel and consistently used its resources to arm and finance terrorist proxies, such as Hizbullah, that target Israel. The leadership of J Street is obviously less interested in the concerns of most Israelis and the realities of their predicament than in aligning itself with an American administration ambivalent at best towards those concerns and realities and with other elites in America who share similar attitudes. Among Jewish students, J Street’s true believers are drawn largely from those whose priorities are the same. Its Jewish student support is also drawn from those who see in J Street a middle course between unabashed advocacy of the rightness of Israel’s case and the legitimacy of its concerns and outright embrace of the assaults of those who want Israel destroyed, a middle course that many hope will pass muster as compatible with the campus zeitgeist. The group also attracts some of the innocent and uninformed who are sympathetic to Israel but know too little to appreciate the dangers that J-Street’s agenda represents for Israelis. It is particularly among the latter two groups that the failure of much of American Jewish leadership as reflected in Gary Rosenblatt’s article looms large, the failure of leaders who bewail the falling away from concern with Israel’s well-being but seek to place the onus for the falling away on Israel. The assault on American Jewish students is intense and entails not only the hate-filled attacks of fellow students but all too often similar hatred emanating from faculty, especially in the humanities and social sciences (and even faculty focused on Jewish studies, as recently reflected in the ugly, intellectually dishonest and morally bankrupt anti-Israel screed produced by Hasia Diner and Marjorie N. Fried and published in Haaretz on August 1), as well as the widespread tolerance of college and university administrations for the assault on Israel and its supporters. Students are rendered more vulnerable to the corrosive impact of the assault on their identification with Israel when Jewish leaders are remiss in their responsibilities to counter that vulnerability both by arming students with the truth about Israel and by providing a strong counter-force against those forces engineering the assault. Rather than offering such a counter-force, some leaders of major Jewish organizations actually extend support to those engaged in the campus assault on Israel. Earlier this year, the current head of the Anti-Defamation League, Jonathan Greenblatt, a former high-ranking Obama administration official, spoke to J Street students and essentially endorsed policies toward Israel promoted in J Street’s campus activities. The ADL, both under Greenblatt and his predecessor, Abe Foxman, has also criticized state and federal efforts to pass anti-BDS legislation, including legislation to withhold funds from institutions of higher learning that enact BDS measures. The ADL has argued that its stance is based on the defense of freedom of speech. But it requires considerable logical contortion to twist into a free speech issue withholding taxpayer funds from publicly supported colleges and universities that pursue policies biased against Israel and ultimately aimed at undermining that nation’s viability. The ADL stance seems rather to be directed towards conforming to the political predilections of particular echelons in America with which its leaders identify, and to doing so with little regard for the impact on Israelis and their well-being. Among campus developments illustrative of the failure of American Jewish leadership vis-a-vis Jewish college and university students, few are as noteworthy as the relatively new “Open Hillel” phenomenon. But in recent years, students on some campuses have taken exception to these guidelines and insisted, for example, that their campus Hillels host events co-sponsored by the virulently anti-Israel SJP and the hardly less anti-Israel JVP, both of which delegitimize and demonize Israel and seek to undermine its existence. Under the rubric “Open Hillel,” advocates of this course claim they are simply seeking to broaden the discussion of Israel beyond the positions articulated in the Hillel guidelines. Thus far only a handful of campus Hillels in America have declared themselves to have embraced the “Open Hillel” agenda. But in fact, many more do partner with organizations that support BDS at some level and promote other anti-Israel policies, most notably J Street but also at times groups such as JVP and even SJP. A key explanation for this is that many, likely most, rabbis serving as Hillel directors - either because of views held before coming to their Hillel position or because they have been won over to conforming to popular campus biases - are themselves sympathetic to the intellectually insupportable and morally obtuse blaming of Israeli policy for the absence of peace and for the wide hostility to Israel in academic circles. In contrast, those Hillel directors who are fully supportive of Hillel International’s guidelines regarding Israel and are unabashed supporters of the Jewish state and its right to demand a genuine and defensible peace in return for concessions are a distinct minority. Moreover, Hillel International has not aggressively sought to hold Hillel chapters to the guidelines on Israel as a condition for their continuing to use the Hillel name. Nor has the wider community of leading Jewish organizations openly addressed the highly problematic developments within this key Jewish campus institution, much less taken a stance on those developments. No doubt this is, again, in large part because so many prominent figures in those organizations are likely to be among the Jewish leaders who are not prepared to challenge Israel-baiting segments of society, such as major elements of academia, with which they identify, and prefer instead to blame Israeli policy for those groups’ hostility to Israel. One hears some voices in Jewish leadership who are essentially sympathetic to the strong Hillel International parameters regarding Israel but at the same time argue that Jewish organizational life ought to provide a “big tent” and be open to Jews of all opinions who want to identify with the community. Proponents of this view suggest, regarding Hillel, it ought to be seen as a positive that those Jewish students so critical of Israel nevertheless want to be part of campus Jewish communal life. But of course they want to be part of Hillel not to share a common space with Jewish students different from themselves - Jewish students who, for example, see Israel differently from how they do. If that were their interest, they would create an “Open J Street” and “Open JVP.” Rather, they want to be part of Hillel so they can undermine support for Israel from within the flagship Jewish campus organization; so that they can use the organization in their quest to separate identifying with Israel - at least Israel as comprehended by and defended by the great majority of Israelis - from Jewish identity. It is certainly true that one can identify as Jewish and even be committed to living life in a manner infused with Jewish content and yet be critical of the Zionist project or supportive of policies that would compromise Israel’s security and threaten its viability. But to welcome such people within a “big tent” of Jewish communal life is morally problematic. It entails giving communal sanction to those who would either deprive fellow Jews of the right of national self-determination accorded other groups or endanger the welfare and lives of the more than six million Jews for whom Israel is home. Nor can the widespread hostility to Israel, nor the murderous hostility to all Jews that seeks justification in anti-Zionism, be legitimately invoked by Jews as a reason for challenging the Zionist project or Israeli policies vital to the security of the state. Again, it has been all too common for some Jews, in the face of anti-Jewish bigotry, even murderous bigotry, to blame other Jews rather than the haters. More broadly, whatever the rationale or motivation, it is morally obtuse for Jewish leaders, such as those alluded to in the Gary Rosenblatt article cited earlier, to ignore the realities of Israel’s predicament and to insist on dangerous concessions by Israel to appease those indifferent to or hostile to the nation’s well-being, whether Jews or non-Jews, whether they are on American campuses or elsewhere. Israel’s primary obligation is not to win a popularity contest either in the world at large or within some Jewish “big tent,” many of whose members have priorities inimical to the state’s well-being. Rather, its obligation is to protect and defend its citizens, build the state along the same ethical, Jewish and democratic principles that have been its essential guidelines since its founding, and to make its case as best its can to the world, including to the jaundiced within the Jewish world, but never to compromise its vital interests for the sake of advancing its case. As Gerald Steinberg said in response to Rosenblatt, “... no, ‘any plan’ that helps Israel’s PR... but makes our security situation even worse, is not better than the status quo.” If that displeases some in the American Jewish establishment, then shame on them. Reports of anti-Semitic acts on American campuses suggest that the nation’s universities and colleges are likely today the chief institutional repository of anti-Semitism in the United States. The study citing these data was conducted by the AMCHA Initiative, and AMCHA Initiative’s own findings appear in the organization’s “Report on Anti-Semitic Activity in 2015 at U.S. Colleges and Universities With the Largest Jewish Undergraduate Populations.” The AMCHA Initiative report looks more particularly at the strong correlation between the presence of anti-Israel groups such as Students for Justice in Palestine (SJP) on campuses, as well as anti-Israel activity such as that of the Boycott, Divestment and Sanctions (BDS) movement, and campus anti-Semitism. The correlation is hardly surprising, since much of SJP’s activities on campus - including the agenda of SJP guest speakers at events underwritten by colleges and universities - consists of demonizing Israel, denying Jewish history and Jews’ right to national self-determination, and advocating for anti-Israel entities such as HAMAS, which explicitly calls not only for the annihilation of Israel but for the murder of all Jews. The BDS movement likewise seeks to delegitimize and undermine Israel’s existence and grossly distorts the history of the Palestinian-Israeli conflict, and leading BDS supporters have acknowledged that the movement’s ultimate goal is the dissolution of the Jewish state. Nor is that goal particularly hidden, nor for that matter in need of being hidden, in much of American academia. Indeed, in March, 2012, Harvard University hosted a “One State Conference” at the Kennedy School where speaker after speaker called for dismantling Israel and attacked those promoting its continued existence. According to the Harvard Crimson, the conference was organized by campus groups Justice for Palestine, the Palestine Solidarity Committee, the Palestine Caucus, the Arab Caucus, the Progressive Caucus and the Alliance for Justice in the Middle East. Why are colleges and universities tolerating an epidemic of anti-Semitic acts on their campuses, and the activities of groups that directly or indirectly promote such acts? At a time when there is so much campus sensitivity about so-called micro-aggressions and the need to render campuses safe spaces for those students who feel victimized, when even seemingly innocuous statements or actions by fellow students or faculty members can lead to punitive measures against them should someone respond by feeling aggrieved, why are the macro-aggressions against Jews on campus allowed to continue with little consequence for the perpetrators? In fact anti-Jewish aggression is more than tolerated. Faculty members commonly use the classroom to join in the demonization of Israel and its supporters, and do so as well in visiting lectures on other campuses and in other venues. Just as the AMCHA Initiative study found a correlation between the level of BDS activity on a campus and the level of campus anti-Semitism, so too did the study find “a strong correlation between the presence and number of faculty who have expressed public support for an academic boycott of Israel and occurrence of overall anti-Semitism, as well as strong associations with each kind of anti-Semitic activity independently.” The BDS movement’s goal - however often disingenuously cloaked in claims of high-minded and benign intent - is Israel’s dissolution. The movement’s delegitimization of Jewish national self-determination and its demonization of those who support Israel is conveyed by its faculty proponents no less than by its student devotees, and so it should again come as no surprise that the former stoke campus hostility towards Jews just as the latter do. But it is not simply individual faculty members that target Israel. Entire departments, particularly in the social sciences and humanities, do so, both via sponsoring anti-Israel activities on campus and by advocating support of BDS by their national associations. Nearly a dozen academic associations have endorsed the academic boycotting of Israel. Resolutions to this effect were passed, for example, by the American Studies Association and the National Women’s Studies Association. One major academic group, the American Anthropological Association, will be voting on a boycott resolution this month, and another, the Middle East Studies Association, voted to have its membership consider such a resolution. The record of Middle East studies departments is particularly noteworthy. Not only do the Hamas rulers of Gaza promote genocidal Jew-hatred but so too does the other Palestinian government, the Palestinian Authority under Mahmoud Abbas, in its mosques, media and schools. In addition, similar genocidal rhetoric is a fixture of media, mosques and schools throughout most of the Arab world and, largely through Arab financing and disseminating, has become a constant theme in the wider Muslim world and within Muslim communities elsewhere. One might think that the phenomenon of contemporary genocidal anti-Semitism in the Arab and broader Muslim world would be deemed worthy of some attention in Middle East studies departments; but one would be wrong. It is the exception among such departments to address the issue and, for example, an undergraduate in most universities which offer Middle East studies degrees can earn such a degree without the matter ever having been addressed in any of his or her classes. The prevailing attitude in such departments is indicated by the fact that in the December, 2014, annual meeting of the Middle East Studies Association (MESA) - in the wake of the Gaza fighting the previous summer and its unleashing of even greater than usual convulsions of anti-Jewish rhetoric in the Arab and broader Muslim world - of the 275 sessions listed in the meeting agenda, none addressed the issue of Jew-hatred. MESA did offer a "special pre-program session" that indirectly touched on the matter of anti-Semitism in the Middle East. During the Gaza war - a conflict triggered by Hamas’s unleashing rocket bombardments of Israeli villages, towns and cities - one Middle East scholar, Steven Salaita, sent out numerous anti-Israel tweets, including one in which he declared that "Zionists" had "transform[ed] ‘anti-Semitism’ from something horrible into something honorable..."
"What we cannot and will not tolerate at the University of Illinois are personal and disrespectful words or actions that demean and abuse either viewpoints themselves or those who express them. We have a particular duty to our students to ensure that they live in a community of scholarship that challenges their assumptions about the world but that also respects their rights as individuals." But the prevailing opinion at MESA was different. That "special pre-program session" at MESA’s 2014 meeting was entitled: "The Salaita Case and New Assaults on Academic Freedom." Too many American colleges and universities have embraced the bias of MESA rather than the principled stand of the University of Illinois’s chancellor. In much of contemporary American academia, as in Orwell’s Animal Farm, everyone is equal but some are more equal than others. Every student is entitled to safe spaces and protection against faculty micro-aggressions, but faculty attacks on Jews and Jewish students, especially attacks on Jews who support the existence and well-being of the Jewish state, are not intolerable acts of aggression but rather protected expressions of academic freedom. And that academic freedom, when it comes to claims against Israel and its supporters, apparently extends to any defamation, distortion of reality and demonization, however bigoted or absurd. Vassar, which has earned a reputation in a very crowded field of being among the leading campuses in the promotion of anti-Israel sentiment leavened with anti-Semitic tropes, hosted on February 3 an Israel-bashing lecture by Jasbir Puar, a Rutgers associate professor of women’s and gender studies. Puar’s lecture was reported to have been sponsored by a number of Vassar departments, with American Studies being the lead sponsor, joined by Africana Studies, English, International Studies, Jewish Studies, Political Science, Religion and Women’s Studies. In response to criticism of Puar’s speech from some quarters, a number of academics came to her defense (among them the aforementioned Steven Salaita, championed by the Middle East Studies association) and signed an open letter to Vassar’s president complaining, among other things, about what the signers characterize as - the reader may well have guessed - the “suppression of speech or academic freedom” supposedly reflected in the comments of Puar’s critics. The Vassar/Puar lecture story is relatively unique for the attention it got - becoming the subject of a Wall Street Journal op-ed - not for its content. In fact, similar lectures and activities defaming Israel and drawing on hoary anti-Jewish tropes are a constant fixture in the landscape of contemporary American academia. It is worth noting that no academic department or recognized student organization would sponsor Eid’s appearance, presumably because he offered something other than the preferred Israel- and Jew-bashing arguments. His talk required direct sponsorship by the college itself. The targeting of Jews on American campuses, as well as the defaming and targeting of the Jewish state, can be construed as in large part an element of the wider blight in contemporary American academia. Particularly in the social sciences and humanities, the objective of faculties is all too often no longer imparting to students a capacity for critical thinking - for examining competing interpretations of factual data and learning to weigh them with some objectivity - but rather indoctrinating students in “correct” thinking. Just as in contemporary journalism, disinterested, fact-based reporting has been largely replaced by advocacy journalism, so, too, advocacy teaching has come to dominate large swathes of the social sciences and humanities. Concepts of “fact,” “factual accuracy” and “truth” are themselves denigrated and dismissed, replaced by an alternative reality of “narratives.” (It is only in such an alternative reality that, for example, the primitive falsehoods purveyed by someone like Puar can be regarded as scholarship.) And, in Napoleon Pig fashion, all narratives are equal but some are more equal than others. It is not simply that fashionable narratives are promoted in the classroom. Students’ grades are often dependent on their satisfactorily imbibing and regurgitating the favored narratives, and those who fail to do so are punished for their recalcitrance. Faculty appointments often also depend on applicants’ fealty to the prevailing fashion. Those faculty - perhaps enjoying some protection by virtue of tenure - who are associated with disapproved narratives, or, heaven forfend, dare to defend such, are often hounded for their beliefs, while others are literally barred from campuses for harboring, and threatening to share, opinions inconsistent with campus groupthink. Sometimes the barring of holders of “incorrect” views is driven by students, but almost invariably it and similar travesties entail the connivance if not instigation of faculty and, in all cases, the acquiescence of administrators. The concept of “safe space” in colleges and universities is, of course, hypocritical in more than one respect. It is a safety offered only to some. And it is invoked to “protect” students not only from insensitivity and hostility but from exposure to views that challenge their own prejudices, views that do not conform to those prejudices. In both respects it is a tool not of civility but of bias and censorship. Jews, or at least segments of the Jewish community, will almost always be targeted in such environments. Jews have by various measures been successful, especially in free societies, to an extent that is disproportionate to their small numbers. So, too, the Jewish state has been a success in myriad respects, a success again disproportionate to its size. Its survival under conditions of ceaseless, murderous hostility from most, often all, of those around it, is itself a notable success, and it has managed to achieve much more than simply survive. When the actual history, the facts, the truth behind what successes Jews and the Jewish state have enjoyed, are learned, that knowledge very often tends to defang any predilection to hostility and rather - as, for example, in the perspectives of many struggling post-colonial states, particularly in Africa but also elsewhere, vis-a-vis Israel - engenders a respect and an interest in learning from the Jewish example. But when the history, and facts, are censored, or denigrated as a mere narrative, and a narrative not palatable to prevailing tastes, then the censors and denigrators open the way for any Jewish success, not least the success of the Jewish state, to be interpreted as unfair, as intolerably disproportionate, as inexplicable except by the impementing of nefarious means. And the defamers and haters and their fellow travelers - whether driven by a bigotry exclusively targeting Jews or by bigotry imbedded in some wider agenda, like that of currently popular, intolerant, “progressive” far Left ideology or of supremacist Islamist religious ideology - have free rein to proselytize successfully in the marketplace of “narratives” that is contemporary academia. And the anti-Jewish assault is tolerated by administrators not least because the Jewish victims, unlike those doing the targeting, are not inclined to make death threats against the other side, or seek to disrupt campus life or issue non-negotiable demands or occupy campus buildings. How then are those appalled by the widespread targeting of Jews and the Jewish state on American campuses to fight back against the assault and bigotry and lies? To be sure, there are on numerous campuses strong, committed, well-informed pro-Israel students who dare to challenge hostile forces both among fellow students and faculty, and their efforts very commonly bear fruit. But the burden of turning back the assault should not and cannot rest solely on them. 1) At some colleges and universities, concerned alumni have begun to cut off support, making clear their reasons for doing so and their insistence that only ending the campus assault, and addressing the sick perversions of “education” that feed it, will lead them to reconsider their stance. 2) Some groups have taken early steps towards compiling a resource for Jewish parents that evaluates American colleges and universities in terms of how hostile their campuses are to Jewish students; a resource that parents can use as they weigh with their children where they would like to spend their college years. Such a resource would, among other positives, further convey to administrators that the indulgence of anti-Jewish forces on campus will not continue to be as cost-free as it has hitherto been. 3) Many colleges and universities are, of course, state-run institutions, and virtually all, including private colleges and universities, are dependent to some degree on state support. Those concerned about campus anti-Semitism have started in recent years to enlist state legislatures to help address the issue. The regents of the University of California, who oversee ten universities in the state, voted in March to condemn anti-Semitism on campus, including “anti-Semitic forms of anti-Zionism.” While the latter statement fell short of adoption of the U.S. State Department declaration that categorically defines anti-Zionism, the denial to Jews of the right of national self-determination, as anti-Semitic, the regents’ move was a step forward. It was a step likely taken in large part because both houses of the California state legislature had voted in favor of the regents responding aggressively against anti-Semitism, including anti-Semitism in the guise of anti-Zionism, on University of California campuses. 4) There have been several recent instances of Jewish faculty suing their institutions for alleged faculty and administrator involvement in supporting, and directly participating in, anti-Semitism on their respective campuses. This is clearly another potential avenue for trying to bring greater public attention to, and address, the cultivating of Jew-hatred across so much of American academia. 5) Parents and students ought to be able to seek redress, including legal redress, when students are the targets of anti-Semitism and administrations are remiss in addressing their victimization and taking punitive measures against the assailants. It is a virtual certainty, supported by myriad examples, that administrators would respond with much more energy and determination were it any other minority group subjected to such assault. In addition, shoddy products, products that fail to live up to standards claimed by manufacturers or required by law, can, of course, be the target of legal action aimed at the recovery of costs spent on them as well as damages related to negative consequences suffered as a result of their use. The contribution of faculty to the assault on Jews on American campuses entails not simply the support given by some faculty to the exterminationist agenda of SJP and the BDS movement but also involves faulty, tendentious teaching. Teachers are entitled to their opinions - although foisting those opinions on students and grading according to students’ embrace of them is, again, indoctrination, not education - but teachers are not entitled to creating their own facts. Despite the craze around “narratives,” and the denigrating of references to facts, the latter do exist. Even the social sciences claim to aspire to minimal standards of scholarship. A course that is advertised as offering “the history of the Arab-Israeli conflict,” or of “the Palestinian-Israeli conflict,” and instead presents falsehoods as facts or only presents one perspective on the subject, and that one a perspective least supported by the historical record, is foisting on students a shoddy product. In some colleges and universities, not only individual courses but the curricula of entire departments are shoddy products. Students who have innocently sought an education in such courses or departments, an education that they anticipate will conform to reasonable academic standards, and instead are given a skewed and bigoted substitute, ought to be able to seek damages. Syllabi, recorded lectures, examinations can be compelling evidence of how much their college or university has failed them. The current low state of American academics, again particularly in much of the social sciences and humanities, and the ethical failings of campus administrators, the conditions that have rendered campuses a safe space for anti-Semitism, have evolved over decades, and the pattern will not be reversed and the rot dissipated in short order. But it is the obligation of parents and others not to be daunted by the challenge but rather to take whatever measures they can to reverse the noxious patterns that have turned so much of academia into an ivory sewer.